With more and more people getting aware of the importance of looking good, the beauty and wellness business has observed a relevant hype in the recent past. As earlier it was considered to cater to the needs of people in show business and the rich only, now this notion has changed. It is for this reason that the salon industry is expected to reach $49.3 billion by the end of 2019. Due to rising competition in the salon industry globally, an efficient management and service delivery is needed. This task can only be fulfilled using good salon software. There are a number of salon software and services dedicated to efficient salon management. Here is a list of best 10 salon software that not only eases salon management but also give the business a boost. 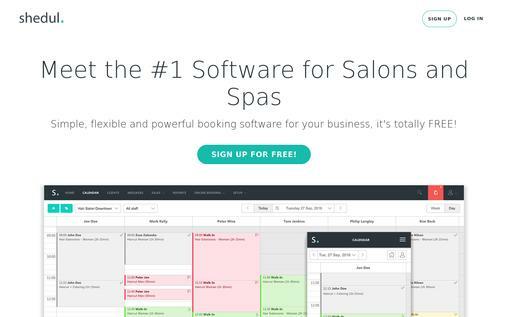 It is inarguably the best software for salon booking management. Trusted by more than 120,000 stylists and therapists in more than 120 countries, shedul is not only simple and easy to use for salon owners, it is also known to provide a satisfactory experience for the customers. Appointments Booking: It allows several online booking options like salon website, Facebook etc. through which an appointment can be fixed. Clients Management: Contact details, appointment history, future appointments along with the client’s preferences can be saved using shedul. Real time activity review: All the bookings and cancelations are notified through a live feed. Reminder management: It sends automated reminders in the salon’s name to the client so that you never miss an appointment. Sales Management: Shedul automatically manages the sales made by the salon and keeps a track record of transactions, generates invoices and receipts and manages applicable taxes. Multiple devices support: Shedul can be run on a wide range of devices thus enabling the user to manage their salon even while being miles away from it. Pricing: This is a completely free software. Spaware is another world leader in salon management solutions. Being a scheduling software, it not only manages bookings but also manages various staff tasks through a simple yet intuitive interface. Marketing functions are an added feature of this software which sets it apart from other similar software. Appointment Reminder: An email is automatically sent to the client as soon as an appointment is created. Security: It comes with a biometric sensor support that ensures unwanted or unauthorized personnel do not have access to the sensitive information of the business. Touch Screen: The touch screen technology allows you to quickly access the information that you need. Stock management: Unlike most of the salon management solutions, Spaware does not disregard the importance of inventory management and thus enables the user to keep track of the products stock preventing overstocking and understocking. Track your staff: Each of the employees can be managed for their schedule and work can be assigned accordingly hence increasing efficiency and consequently, more customer satisfaction. Motivation: It not only suggests staff goals but also analysis each employee’s track record thus ensuring the user gets maximum out of their employees. Pricing: The lease feature of it lets the user own it for as low as $30 a month. 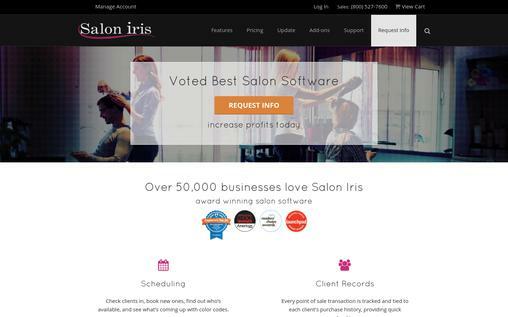 Salon Iris is a multi-award winning salon management platform that is used by more than 50,000 businesses across the globe. App support is also offered by it as a unique feature along with other multiple add-ons that make it unique. Security: Salon Iris features a number of security measures against data loss like automated backup, individual employee passwords, and ID cards, maintain visitor book, etc. Reporting: The dashboard updates real-time reports for performance, both individual and collective, profit and loss, sales totals and tax calculations. Marketing: Email templating is a major feature that makes this software unique as it not only provides a customization to target different audiences for marketing. This software also traces marketing strategy success, and also help you formulate a correct marketing strategy. Pricing: It offers the most diverse subscription options which can either be monthly (from $39/month) to one-time charges (from $499) each of which has been sub-categorized as per the offered features. 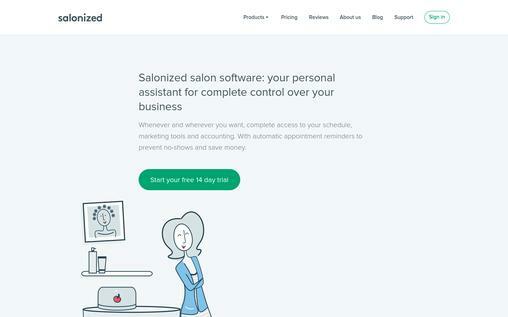 MINDBODY is one of the fastest growing salon software that helps both startups and well-established businesses. The special feature of this software is that its features are similar for all segments of salons all over the globe. Not only does it manage the salon but also its employees. Booking across multiple platforms: Apart from online booking through the salon’s website, the clients can make use of social media platforms too. There is also an app available for online booking management both for clients and salon owners. Marketing: Scheduling appointments is only a basic feature that all salon software possesses. But planning the marketing strategy is what MINDBODY has to offer additionally. Retention: It enables the users to create a dedicated app for their salon which is helpful in gaining new customers and retaining older ones. POS: It supports linkage with all in-store hardware for sales management. On top of that cell phone, hardware can also be calibrated to be compatible with the app. 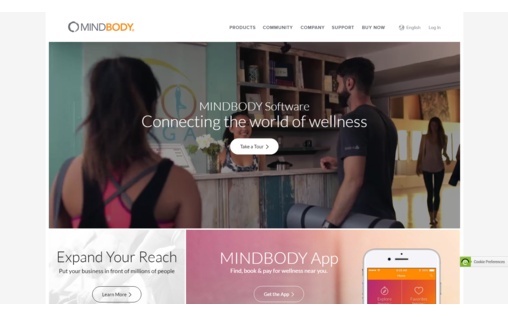 Additionally, an online store too can be launched and managed through MINDBODY. MyTime is not only an appointment calendar manager but also a communication center because it enables its clients to be approached by customers as well. The management is carried out by MyTime but the way it is to be carried out is completely controlled by the client. Discovery, Booking, Retention, and Reviewing: From letting the salon be discovered and booked to being responsible for retention through various tools and getting real customers to review the salon, everything is managed by MyTime itself. 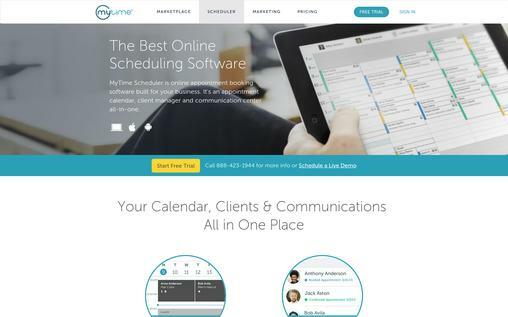 MyTime Communicator: It allows you to manage your clients and answer their questions from one place. Manage schedules: Use the mobile app or web to manage your schedule from anywhere. Offer convenient and 24/7 online bookings to your client. Security and backup: Security is handled through a number of tools including different logins for the staff that controls the extent of accessibility available to each employee. Encrypted Backup of appointments, sales and tax calculations is kept on the cloud server to prevent loss of data. Pricing: Flexible pricing is offered for a list of services offered by it that ranges from $74/month to $149/month. A free trial for a period of 14 days is also provided with all the features. 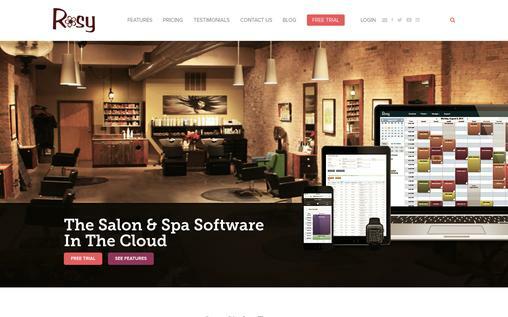 Salonized is a completely salon dedicated software that concentrates on delivering services for salons only. Instead of being an office software, Salonized offers all its services across all mobile phone platforms so that the salon can be managed while you are on the go. Appointment Management: Anything regarding Appointments, be scheduling, rescheduling, postponing or cancellation can be done on the tap of the screen within seconds. Financial Management: The salon manager no longer needs to manage any Excel sheets for updating financial records. Salonized offers hassle-free real-time management of payments in it itself. Customer Care: The customers are not only reminded of their scheduled appointment in the saloon but also asked for a feedback to ensure satisfaction. To ensure customer loyalty and retention, automated emails are sent too. Employee Motivation: It links financial management to employee accounts. This not only facilitates automated payment but also serves as a Motivational source thus engaging them in a better working environment. Pricing: The pricing can either be selected on the base of services one is willing to avail (US $15/month/service) or the number of employees in the salon (the US $29/month onwards). A 14-day free trial is also offered. Rosy is one of the most customizable salon software available in the market. The services of it are available in two different packages – Standard and Premium. This option to choose a plan provides a salon with the liberty of choosing services as per its requirements. The standard features include all services provided by any other salon software except for the ones provided in the Premium package. Inventory Management: It lets you know when you are running low on products. Appointment confirmation: Keep your clients and staff updated with text alert. Mobile Access: It allows the salon owner and the staffs to manage and view the appointments on their smartphones or tablets. Rewards & Referrals: It builds up loyalty programs that not only provide the foundation for reputation but also ensures the customer returns to the salon more often. Mass Emails and Texts: Mass emails, customized with impressive templates as well as bulk text messages disregard of service providers can be sent to customers that are target specific, thanks to software’s comprehensive sorting options. Image library: An image library is also maintained in it that not only builds customer loyalty but also enables in tracking the history of the customer with the salon. This library also serves uses in the designing of emails for connecting with the clients. Website Builder: It enables the client to build their own website using several customizable templates and the ease of a simple drag and drop feature. Pricing: The pricing is decided based on the number of people who provide the service in the salon. For one service provider, the charges for standard features are $29/month and for premium features, the charges are $37 per month. Salon ultimate is by far the sole hybrid system for salon management available in the market. It comes in two versions: one being the desktop software for on-location functioning without an internet connection and the other one based on cloud computing for management through mobile devices. Inventory Management: It keeps a real-time count of the stocks available in the inventory and also suggests re-orders so that the stock count in the inventory remains optimized. Security: Understanding the importance of confidentiality in business, Salon Ultimate offers state of the art security features such as password and fingerprint reading, timed signing out, access to external partners through login, etc. POS: Easy management of funds through multiple tender payments and customized payment options along with the merging of transactions and reminders for membership is also managed within it itself. Marketing: Customer communication through customized emails, automated replying, and suggesting rewards for referrals and loyal customers is another feature provided by it. Pricing: The pricing is classified based on location subscription. The single location subscription costs $149/month whereas multiple location subscription costs $179/month. Schedulista provided the liberty to link the salon software directly to it or a scheduling page can be created on it or the website. The public scheduling page is highly customizable as per the requirements of the client. 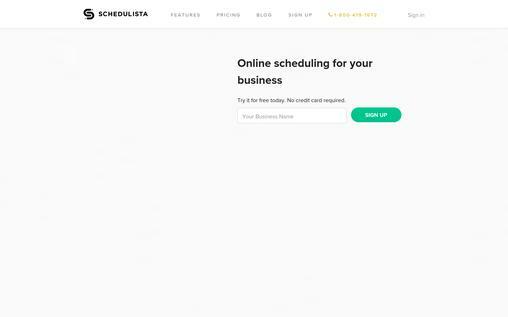 Schedule: Get your own public scheduling page or get now button through which your clients can schedule appointments online, without creating an account or logging in. App Support: It lets the client manage their salon appointments even when you are anywhere in the world through Schedulista mobile app available on Android as well as iOS. Facebook Integration: It links the appointment booking feature to the Facebook account of the salon thus facilitating the customer to book appointments more easily. Marketing & Analysis: Not only does the app automates email marketing and auto-replying, but also evaluates and presents reports on the success of marketing strategies. Pricing: Depending upon the size of staff, it is available on lease at $19/month for one person onwards. 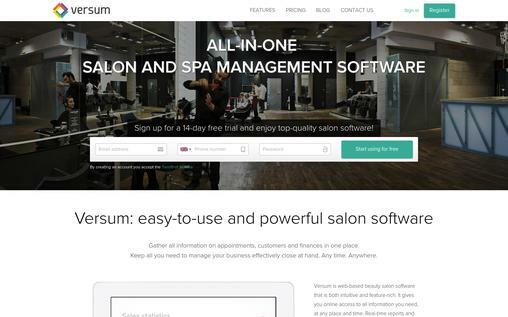 Versum is an all-in-one salon and spa management software suitable for both small salons to chain based salons. Versum provides simple yet powerful interface for the salon management due to which it is trusted my more than 11,000 hair and beauty professionals. Customer Service: Versum concentrates upon helping the clients to build a customer base by suggesting Rewards and Discounts for loyal customers on the priority basis based on their history. Marketing options: The automatic system of email marketing does not blindly send bulk messages but considers target audiences and designs emails using relevant templates. Settling Commission issues: It spares the client from end-of-the-month chaos while settling commission of the employees by automatically generating reports based on the information inputs made throughout the month and accordingly suggesting payments. Auditing: Versum automatically maintains the record of inflow and outflow of the finances thereby not only maintaining a clear register of funds but also generating reports regarding the business of the salon. Pricing: Different plans based on a number of employees working in the salon, begin from as low as $25/month for a single employee. 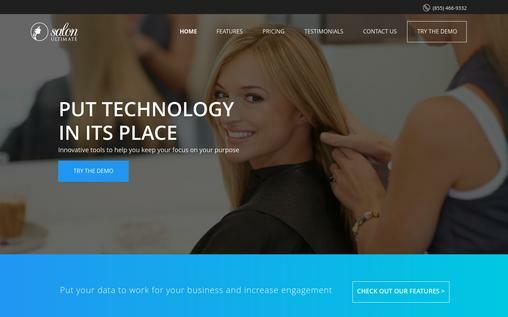 Salon software has seemingly eased the process of managing a salon. From sales, employee and inventory management to revenue reporting and customer outreach, everything can be controlled using this software. Thus, it can be concluded that salon software has a significant role to play in the expansion of the salon business. Start promoting your hair salon across the world right away with MailGet Bolt – an effective & affordable email marketing software service, which allows you to send bulk emails in just a single click. Do take a look at Zenoti (www.zenoti.com) as well. Zenoti is an easy to use cloud based solution for managing single location salons to large multi-center chains of over 200 locations. Leading salons across the world including Gene Juarez, Rudy’s Barbershop, Enrich Salons, Lakme, Douglas J and many more use Zenoti to optimize operations and grow their business.